SUN PHARMA closed the week on positive note gaining around 3.70%. As we have mentioned last week that resistance for the stock lies in the zone of 700 to 710 where trend-line joining lows of November-2015 and June-2016 is lying. If the stock manages to close above these levels then the stock can move to the levels of 720 to 730 from where the stock has broken down from the lows of September-2016 and October-2016. During the week the stock manages to hit a high of 717 and close the week around the levels of 714. Minor support for the stock lies in the zone of 680 to 690. Support for the stock lies in the zone of 655 to 660 where the stock has taken multiple support on intraday basis. 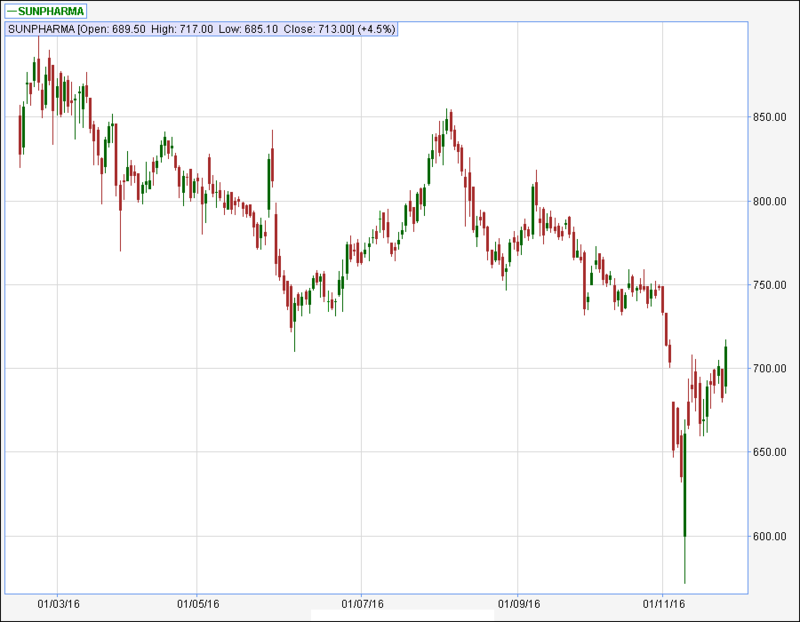 If the stock manages to close below these levels then the stock can drift to the levels of 640 to 650 where the stock has formed a gap on 27/06/2014 and also the stock has broken out of the double top pattern formed in October – 2013 and February – 2014. It seems that the stock should hold these support zone. Resistance for the stock lies in the zone of 700 to 710 where trend-line joining lows of November-2015 and June-2016 is lying. If the stock manages to close above these levels then the stock can move to the levels of 720 to 730 from where the stock has broken down from the lows of September-2016 and October-2016. Broad range for the stock in the coming week can be 665 – 670 on lower side to 730 – 735 on upper side.